One thing that Canvas is awful at is giving extra credit to students. 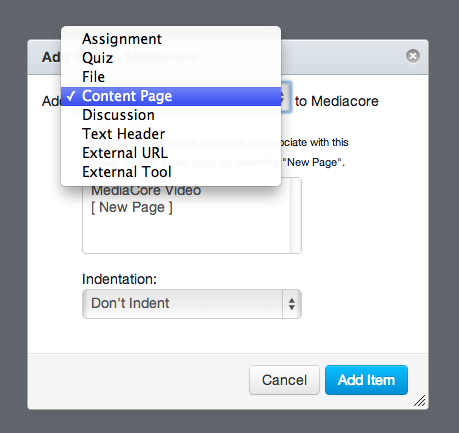 Unlike D2L, there are no built in “extra credit” grades, assignments, quiz questions…etc. SO, to do extra credit in Canvas, you have to be creative. 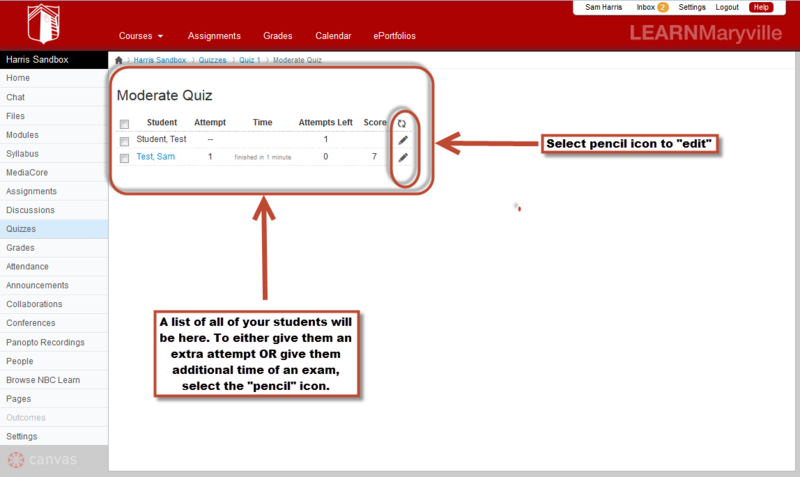 Below are several options for creating extra credit assignments (courtesy of Canvas Guides). Add extra points to an Assignment you’ve already created. 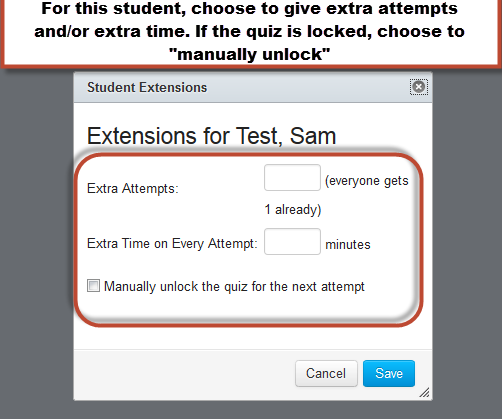 Manually enter the extra points in the Gradebook. As in this example, this assignment is worth 10 points. 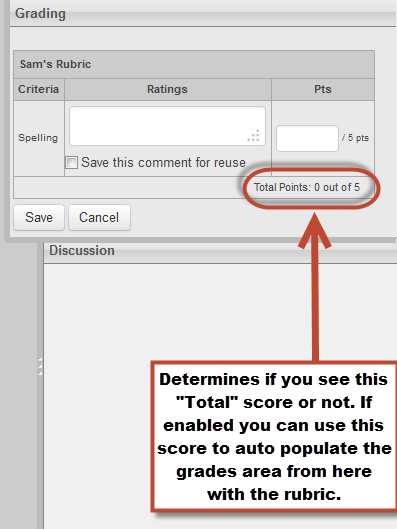 Adding 5 extra points will bring the assignment total for this student to 15 points. The added points will increase total points calculated in the Gradebook’s final grade. You can also use Fudge points to add extra points as well. Most Instructors require an online or paper submission for assignment submissions, but you can also select the option for no submission. No submission assignments work well for classroom duties, such as moderating a discussion or for in-class presentations. 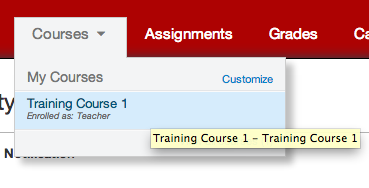 Create a new assignment with zero points possible  and in the Submission type drop-down field, choose No Submission . After students complete the work, manually add points in the Gradebook. 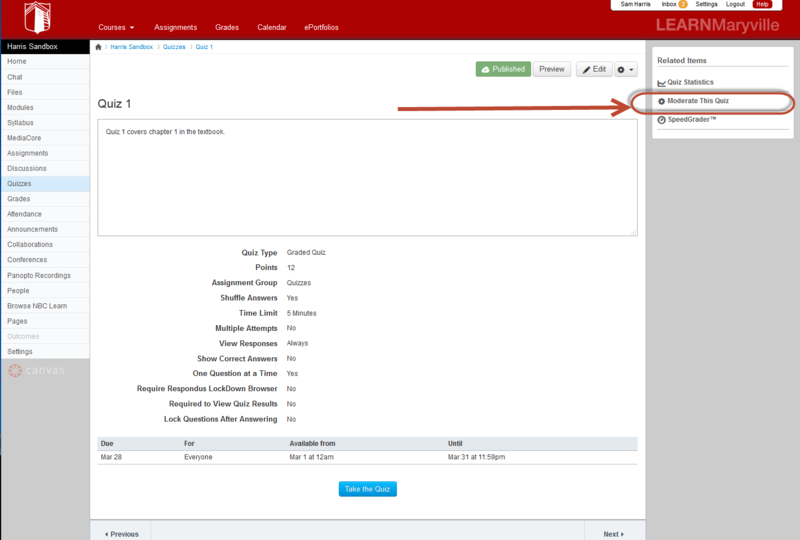 Assignments must be housed within an assignment group. 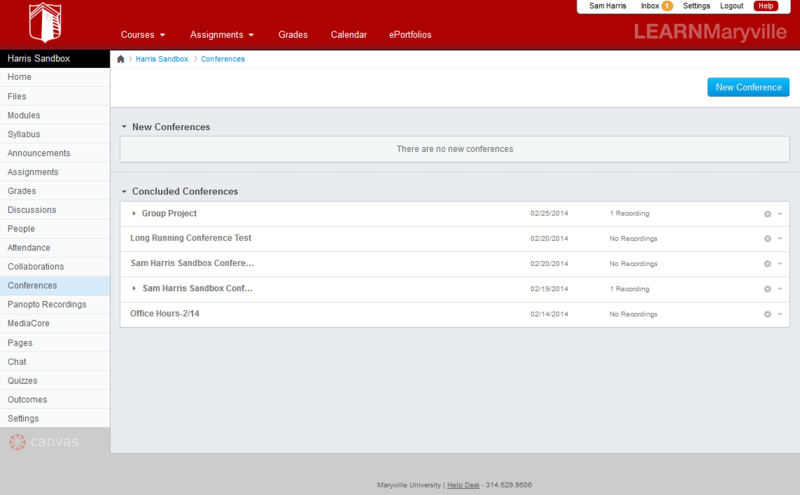 Assignment groups can be unweighted or weighted, depending on how you wish to grade students within your course. 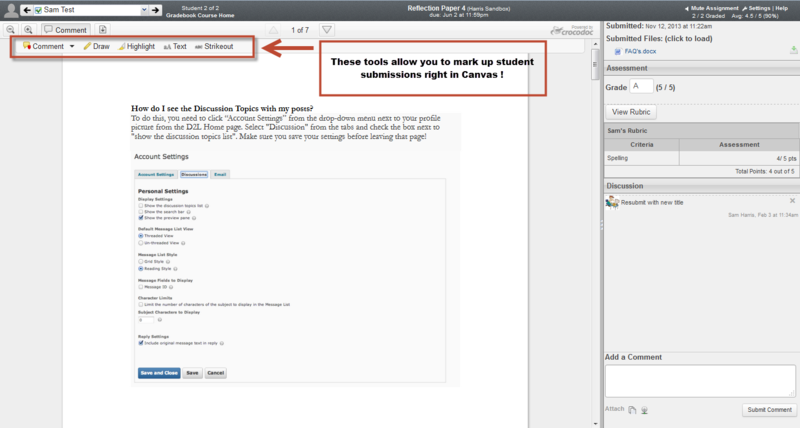 Click here to learn how to create weighted assignment groups. 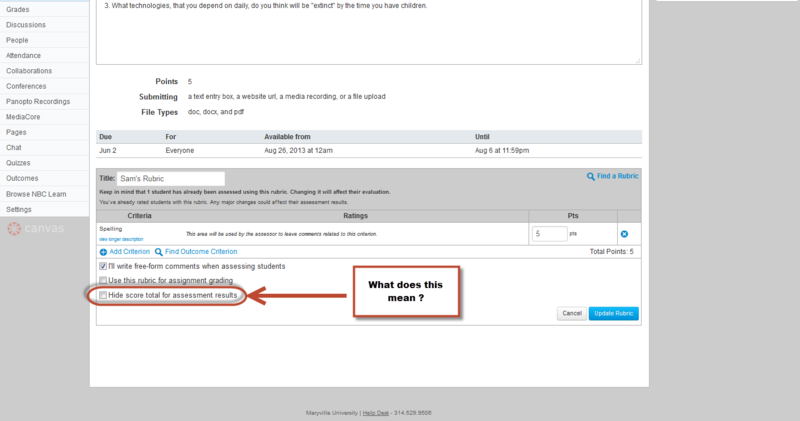 When assignment groups are weighted, Canvas will not calculate grades for an entire group that has no points possible. Therefore, for extra credit assignments to calculate correctly in weighted groups, they must be housed within an existing assignment group that has at least one assignment worth more than zero points. 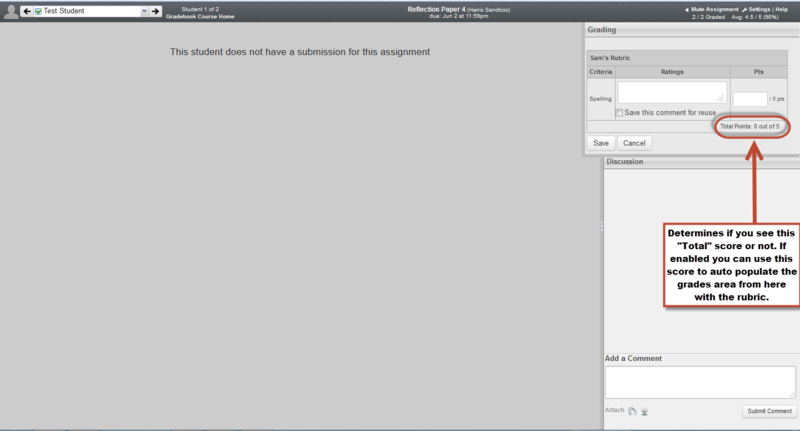 In this example, the extra credit assignment is housed within an assignment group with multiple assignments worth more than zero points . Notice how the assignment groups are weighted . If you create your extra credit assignments with zero points within their own assignment group, but you decide to weigh your assignment groups, your extra credit assignments will not calculate correctly within Canvas. Canvas cannot calculate assignment groups where there are no points possible. For example, if the student has 12 points of 0 points possible, Canvas can’t determine the impact to the overall grade because 12 cannot be divided by 0. 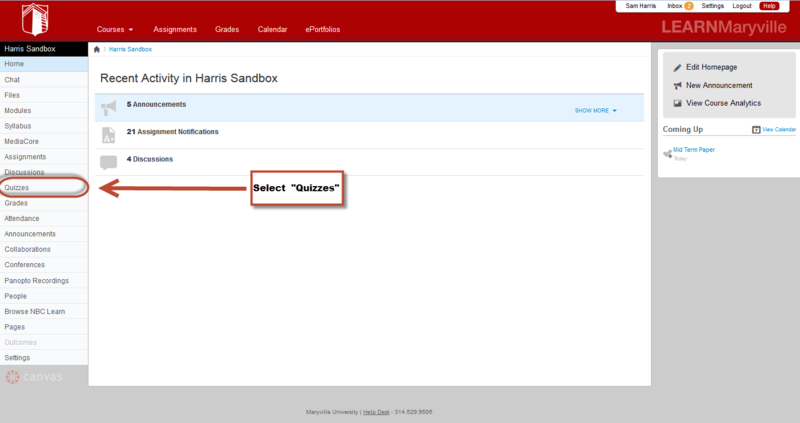 One question I received quite a few times during training was “how do I email my students.”: Well, In Canvas you email students via “Conversations,” which you can access by selecting “inbox” on the Global Navigation bar. Now, Conversations will be changing soon (see my previous post for details). It turns out that I lied a bit in that previous post when I said that this change was purely “aesthetic.” I’ve just learned that there is at least one big functional difference between “Old” and “New” conversations. 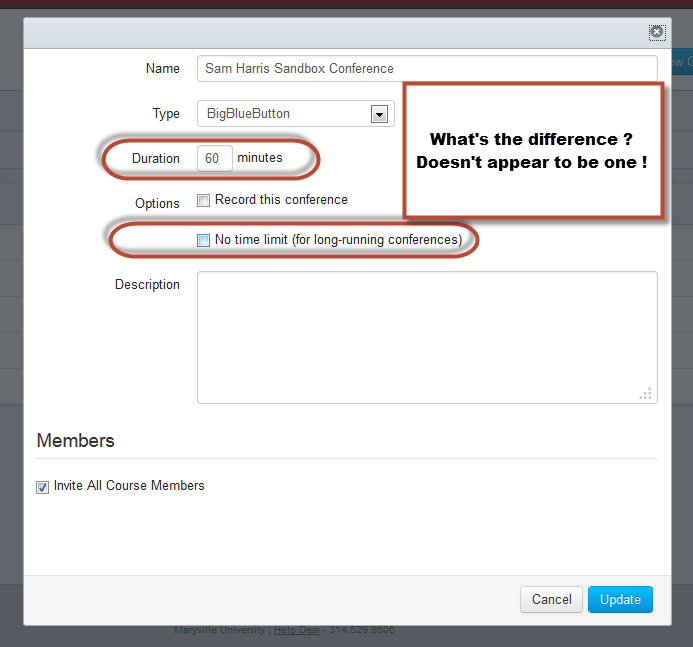 You CANNOT email multiple courses at once in the “New” conversations. 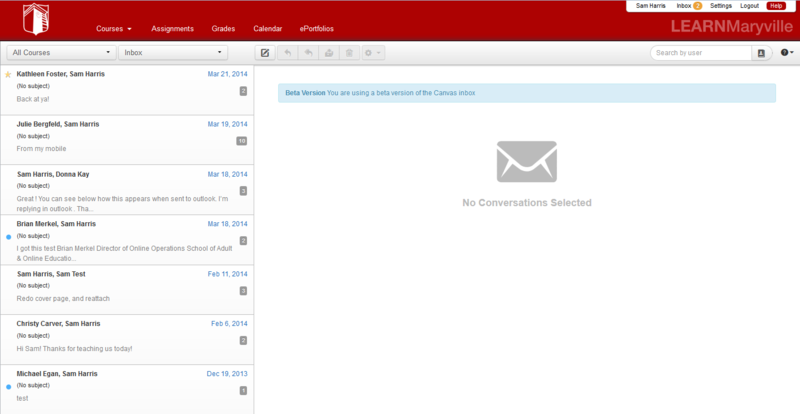 In the old version of conversations (below), you had the ability to email multiple users/courses at one time. 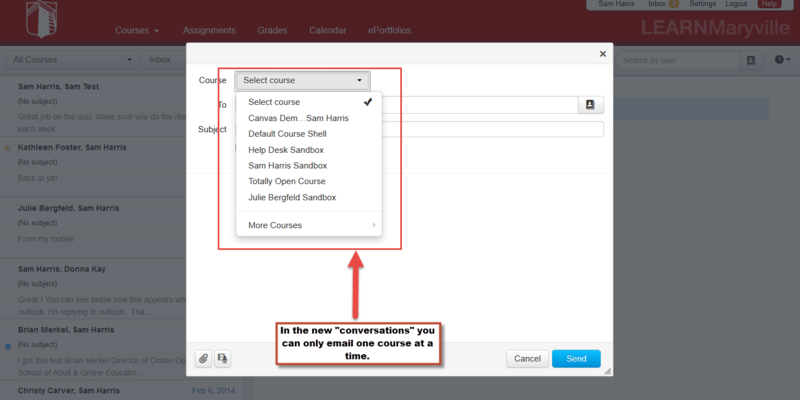 However, in the “New” conversations, you can only email one course at a time (see below). I’ve submitted a feature request to have this function added to the new conversations. 1. 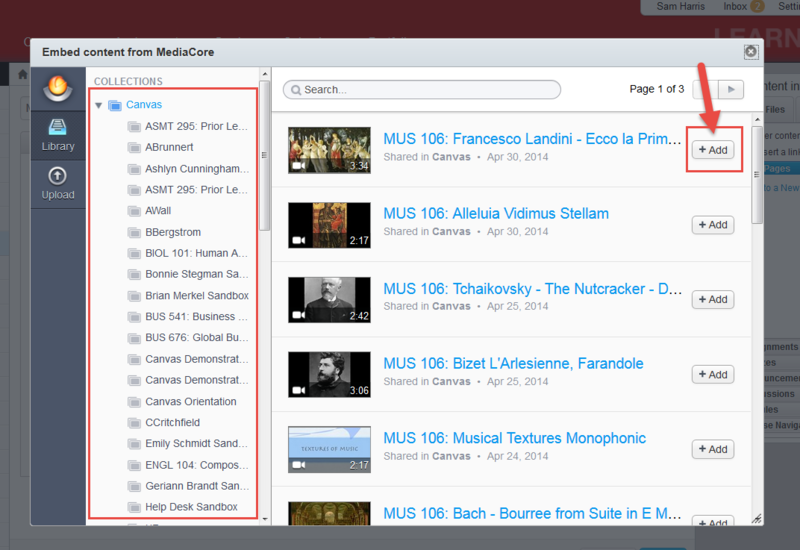 From the “Courses” drop-down menu, choose the course you would like to upload video into. 2. From the course navigation bar, select “Modules.” You will either need to add these videos into an existing module OR create a new one. 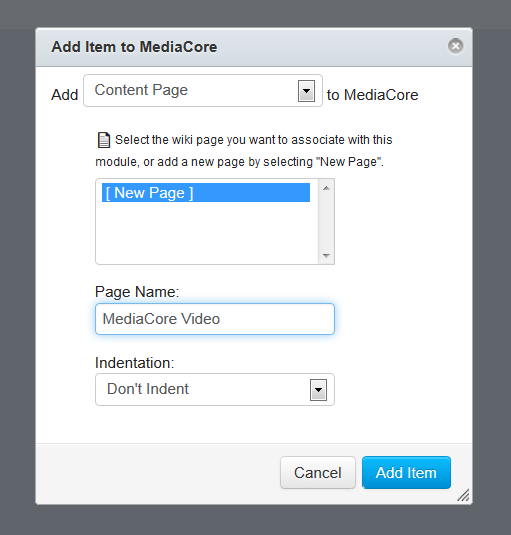 ****Note: To upload a video into MediaCore, see the “Upload button in the image below. The process after selecting “Upload” is fairly simple. 6.Once added, you can add additional videos (using the above method) OR use the rich content edit to add images, text, and audio….etc. Select “Save” when finished. 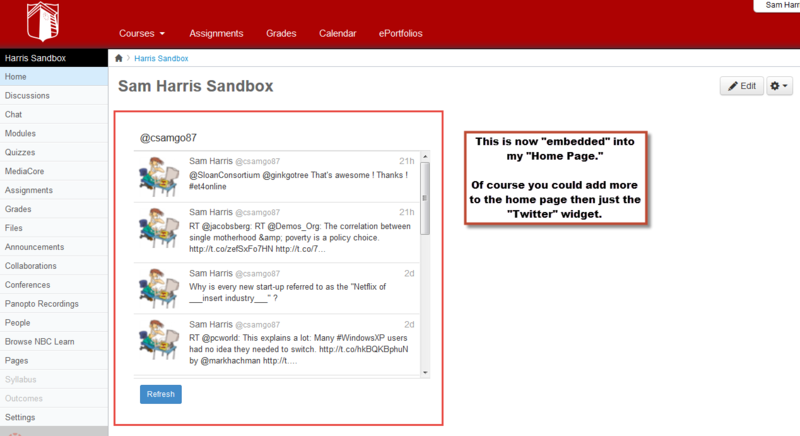 We had several faculty doing this in D2L, and I’m pleased to say that it’s MUCH easier in Canvas. 2. Locate “Twitter” on the list, and select it. 3. Choose to “Add Tool.” It will install the tool into your course. Then, go back to the “Home Page,” and choose to “Edit” the page. 4. From the “Rich Content Editor,” select the “V” drop down. Then choose “Twitter.” A dialogue box will appear. 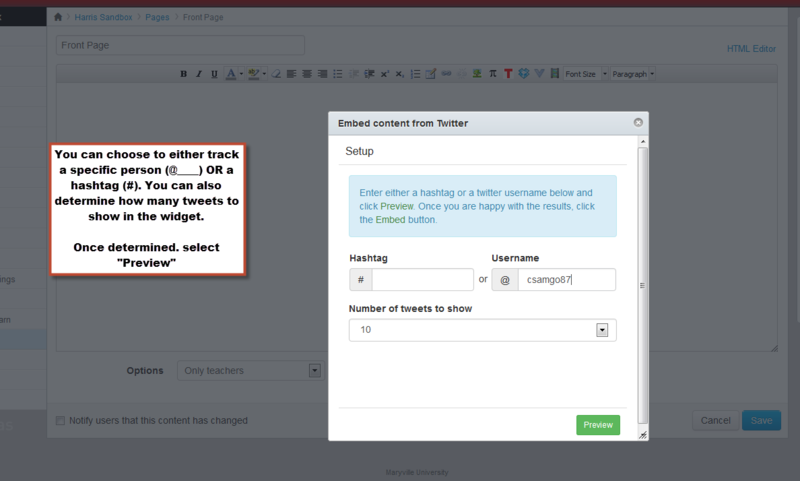 This will allow you to either insert a widget that tracks an individual Twitter account (@____) OR a hashtag (#). 5. 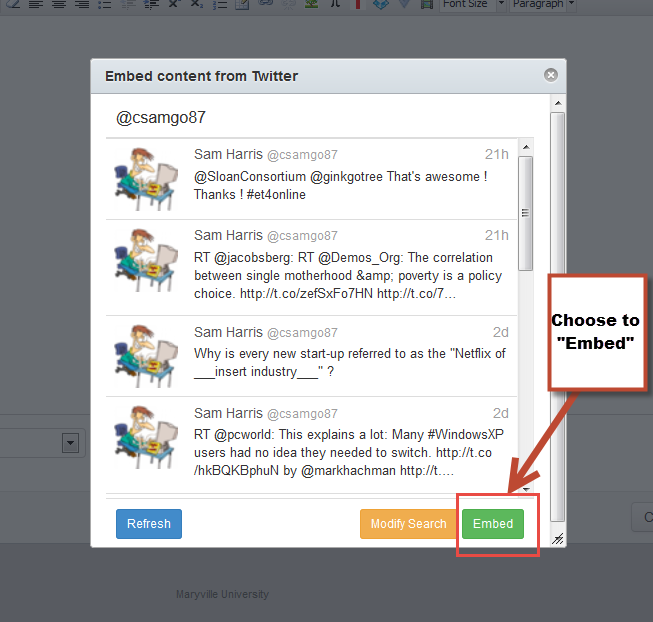 Once selected, choose “Preview,” and then “Embed.” This will embed the widget into the home page. “Save” the homepage, and that’s it ! One question that we are anticipating coming up as we move to Canvas, is how to “moderate” student quizzes. Often times, faculty need to give students “special” access to quizzes for a variety of reasons. 1. 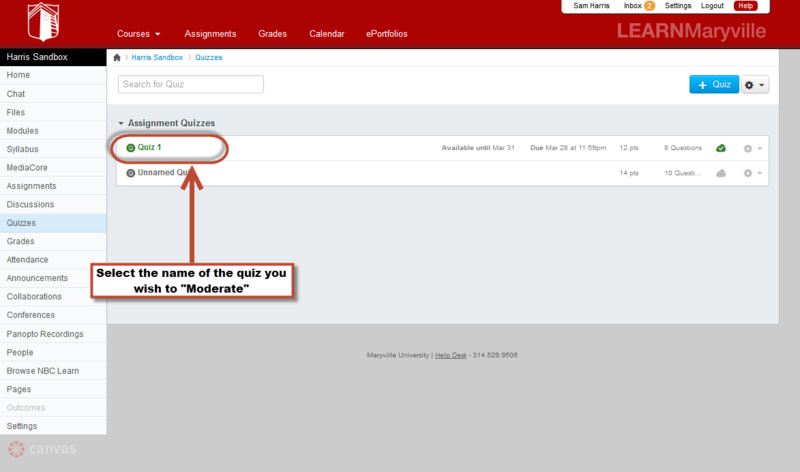 Go into your Canvas course, and select “Quizzes” from the navigation bar. 2. 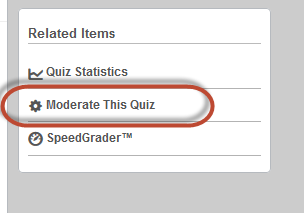 Locate the quiz you wish to “moderate” and select the name of it. 3. This will take you to the information for that quiz. Locate the “Moderate This Quiz” button on the right hand side and select it. 4. This will take you the “Moderate Quiz” screen. You will have a list of all of your students and the following information will be provided. To give your student extra time and/or an extra attempt, select the “pencil” icon. During this switch to Canvas, I’ve spent A LOT of time learning the in’s and out’s of the system. One of the only things I couldn’t wrap my head around was the difference, in Canvas, between a “Private” and “Public” ePortfolios. Well, I finally figured it out ! In Canvas there are two types of ePortfolio, Private and Public. This is the difference. 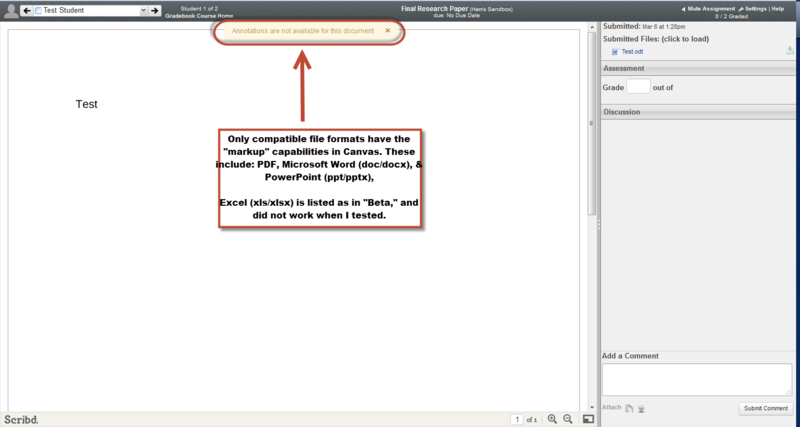 To share a “Public” ePortfolio, you need to obtain the URL from Canvas. I can send this link to anyone, and they can easily access the ePortfolio. In addition, anyone can type in that URL and access this ePortfolio. So, if you have a public ePortfolio, all anyone would really need to do is make a series of guesses for the URL. ex. http:maryville.instructure.com/eportfolios/1, http:maryville.instructure.com/eportfolios/2, http:maryville.instructure.com/eportfolios/3, http:maryville.instructure.com/eportfolios/4……etc. Anyone can search for public ePortfolios on the Canvas system if they know how, and eventually, they would find your public ePortfolio. Now, below you will see the ePortfolio dashboard if it is set to “Private.” Notice that there is a link that says “Copy and share this link to give others access to your private portfolio.” Once you select that link, it changes the URL at the top. The above is the URL you would copy/paste and send out to others, and only if they had this link would they be able to access the ePortfolio. With a “private” ePortfolio, nooone can simply guess the URL. See what happens when I type in the original “public” URL (Http:/maryville.instructure.com/eportfolios/36). It prompts me to log in. Once logged in, the page is blank and it gives me an “unauthorized” error at the top.